DataWorks Powers Through Sandy Outages | Data Works International Inc.
Superstorm Sandy left 300,000 homes and businesses without power in our area, the Lehigh Valley of PA. Due to high wind and flood warnings, DataWorks closed early Monday afternoon so that all staff members could travel home safely. Our power was restored late Wednesday, but phone and internet service remained unreliable due to a problem at a major Verizon hub serving our office park. By the end of the day Thursday, all services were restored and DataWorks resumed full operations. 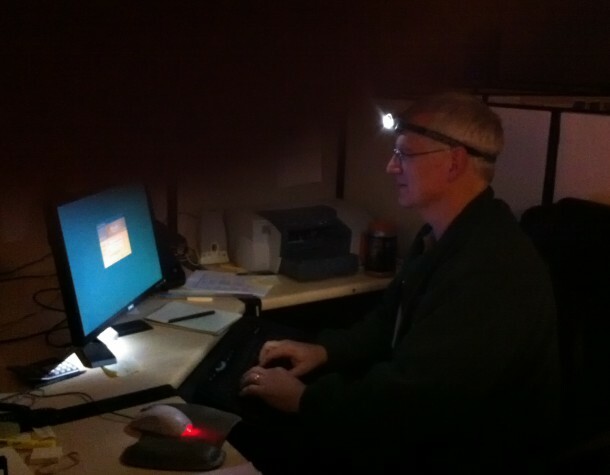 Scout leader and intrepid DataWorks programmer Bill Gade is always prepared! Wegmans, for remaining open and having hot coffee and muffins! While we are glad to have normal functions again here, we know that many other individuals and businesses are facing devastating losses. Our hearts go out to them as they start to recover and rebuild.